It was smart to release WONDER WOMAN ANNUAL #1 in the same week that the movie came out. The Annual is comprised of four different short stories that perfectly encompass the honor, courage, and spirit of Diana, Princess of the Amazons. This article will be in praise of it. There were four writers and artists that worked on Annual #1, and they clearly understood who they were working with. They bring to the forefront Diana’s most prominent traits, and they capture her essence as the most iconic female superhero of all time. 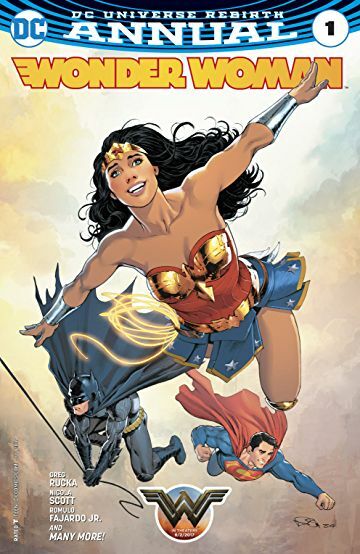 “And Then There Were Three…” by Greg Rucka, tells the story of the first encounter between Batman, Superman, and Wonder Woman. They are mistrustful of each other at first, but they eventually find common ground. Next up we have “In Defense of Truth and Justice,” by Vita Ayala. Here, Wonder Woman intervenes in the trial of King Shark. The humanoid shark is being accused of murdering a decorated general by the Markovian government. Wonder Woman rightfully sees that there’s more to the story than meets the eye. In “The Curse and The Honor” by Michael Moreci, we learn more about honor and sacrifice. Wonder Woman goes head to head with a warrior stricken by a plague, who begs her to kill him before his curse destroys him. This forces Diana to make a terrible choice. Lastly we have “The Last Keiju” by Collin Kelley and Jackson Lanzing. Here we find a giant Godzilla-like monster who is locked in a ferocious battle with Amanda Waller’s military forces. The Lasso of Truth is revealed, and it shows the beast’s true origins, but Diana eventually saves him from annihilation. Now that you get the gist of things, let’s explore further. No one likes to play favorites, but we do have to say that Rucka’s story is the best of WONDER WOMAN ANNUAL #1. Rucka is considered WW’s primary writer, and with this story it’s made abundantly clear why that is. He captures Diana’s true essence, returning to the Year One storyline and tackling the first encounter between these legendary superheroes. Their personalities are spot-on, and they’re richly defined. These are younger versions of these iconic characters, and there’s a fresh energy crackling in the air. You see that Batman, Superman, and Wonder Woman are testing the waters with each other, and by the end of it, we get the sense that Wonder Woman is going to come out on top. Batman sees her purity of spirit and innate honesty, and this purity allows WW to shine. The second story may not shine like the first, but it still holds a lot of merit and is timely, in many ways. Ayala draws parallels to the injustices of our modern war on terrorism, and the inherent prejudices that it brings. The story involves a corrupt military veteran that positions King Shark to take the fall for the crimes of a respected general. Since King Shark is ugly in appearance, and has a criminal history, he’s an easy target. WW plays the role of the hero who should exist in our modern world, but doesn’t. She intervenes on the Shark’s part and proves that the allegations are false. Sadly, in the real world, no one would step up and save King Shark. This drives home the heroic integrity of Diana Prince. Moreci’s story brilliantly boils down the essence of Wonder Woman. It all comes down to the Warrior’s Code. WW’s combatant, Kikori, becomes a disgusting beast and begs her to kill him. This is a marvelous test of ethics for WW, and she obliges, killing the old warrior and taking his place as defender of the village. This story illuminates how Diana is a hero to her core. What makes this unique is that Batman and Superman wouldn’t have done it, because they’re black and white on their no-killing principles. Diana’s code is different. Moreci’s story proves that Diana’s code is that of a warrior. Thanks to her background, she understands a warrior’s pride, and she’s smart enough to understand that there are things that are worse than death. The story beautifully tests the boundaries of heroism. The last story of the Annual is the simplest by far. Diana defends a monster, turning against her own allies to take him to a safe place. This action shows Diana’s goodness and moral strength, and that she’s willing to protect the innocent, no matter how scary-looking they might be. Diana turns against her allies, driving home her lack of a national identity, and how this benefits her. Many of her fellow heroes identify with American values but Wonder Woman doesn’t abide by national laws, like her outfit suggests. She was taught her moral codes by the Gods and Goddesses. Although simplistic, the story is wonderful, reminding us that Diana always does what she knows to be right. Once the Lasso of Truth tells her what to do, she acts. Without a doubt, fans of Wonder Woman absolutely must read WONDER WOMAN ANNUAL #1. 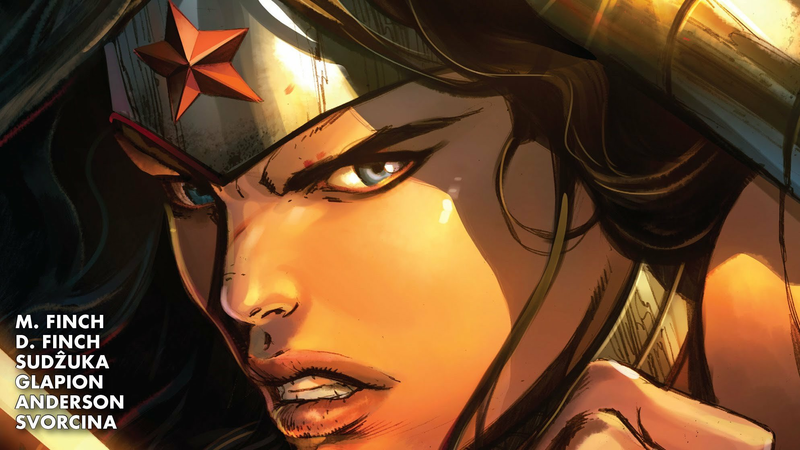 These are very different tales, but they all bring out the true essence of Wonder Woman. Each story analyzes her character from a different perspective, while still remaining true to the core of who she is. In essence: a wonderful showcase of Wonder Woman done right, and a perfect companion to the film that was a smash hit. This is the noble Amazon at her most inspiring.